Yeah, that pretty much sums up what the game is like. It's neat to find out the other thing they tried first was getting players to hate each other, though. :) Glad they found a different way. I've always wondered, if I asked the creators what the story they meant to tell, was the same as the story I got. I'd really like to know... especially about the end. "Rather than push each other to help each other," he said, "they like to push each other into dangerous things, to kill each other." Likewise, displaying player names was considered, but given the "aggressive" nature of many handles, and the fact that real world references can pull a player out of the game world, the option was canned. In other words, kids and assholes shaped the game's development because they couldn't be trusted to help each other. Given what comes out of xbox LIVE headsets, I don't see any reason to ever want contact with other unknown gamers, so I think they made the right move from what I saw. Shame I can't play the damn thing. I watched my roommate play this game and it is on my "To do" list of games and I can safely say that if you play this game and aren't moved by the experience then you don't have a soul. This is one of those beautiful, artistic games that I would love to play and experience for myself, but probably never will. Why? Because the publisher has chosen to artificially limit their audience (and their income) by making it exclusive to only one system. Some of us PC gamers would love to see more games like this, it is a pity so few developers are (or are allowed to be) platform agnostic. 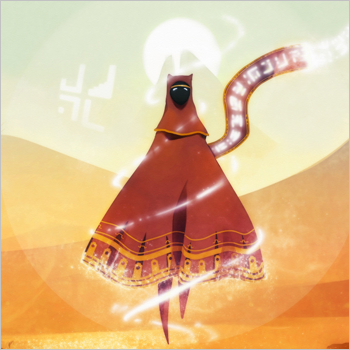 It stinks that Journey cannot become multiplatform, but part of the reason it exists is because of Sony's three game contract with thatgamecompany. I don't know if they could have gotten the same kind of funding if they didn't have a deal like that, and I think that would have had an impact on the game's development. Still, I wish there was a PC port, since I don't always have my PS3 available.